When we brought the first SARGO boat to the West Coast of North America in 2013 we knew they would soon be popular in Alaska. SARGO boats are CE Certified as Category B-Offshore. Category B includes boats operating offshore with winds up to 40 knots, Beaufort Force 8, and significant seas up to 13 feet. 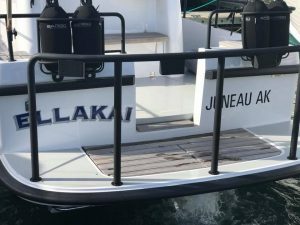 This is a great atribute for any boat heading to Alaska, and we are excited that the Ellakai is the one blazing the trail up north for SARGO boats. This is the trip log of Jack Schmidt’s and Brian Krantz’s wild, 2.5 day adventure to deliver the boat from the San Juan Islands in Washington to Juneau, Alaska. The day before departure we prepared for our journey with some final system testing before the Ellaki started her trip home. We were excited to do a fast but safe trip. It was a total of 832nm (957 miles) from Lopez Island, WA. to Juneau, AK. We planned to get fuel every afternoon and evening. Ellakai, named after the Schmidt’s children Ella and Kai, has about 100 gallons of diesel fuel and gets just under 3 miles per gallon running 33MPH. Her top cruise speed is 36 MPH getting 2.8 MPG. We were heavily loaded and bottom painted so were getting only slightly less than this. We were able to monitor consumption and know our range at the current consumption with our integrated Garmin and Volvo electronics. We were hoping to make the trip in three long days. 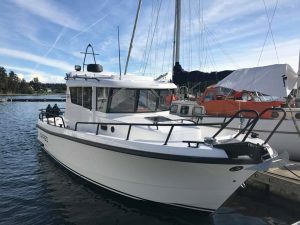 The plan was Lopez Island WA to Port McNeill BC (230 nm) the first day, then to Prince Rupert (297 nm) the next day and on from there to Juneau ( 305 nm) on the third day. In this picture Ellakai is tied safely to the dock in Spencer’s Cove Private Marina on Lopez Island. Below is the trip map of the journey. Click on each point marker for pictures and information!